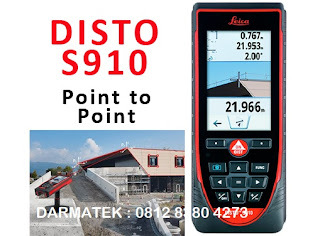 Contact segera : +6281283804273, wa : +6281283804273 dengan Darmatek untuk info dan cara order leica disto S910 meteran laser 300m dengan harga murah di Jakarta. Leica Disto S910 ini produk terbaru dari leica disto dengan spesifikasi tinggi dan fitur-fitur yang canggih. dengan jarak 300 m memudahkan pekerjaan anda. Save all the measured points into a DXF file, as a floor plan, wall layout or even as 3D data, which can be downloaded later in the office to a PC via the USB interface. Equipped with P2P Technology, the Leica DISTO S910 revolutionizes the measurement process using a hand held laser distance meter. 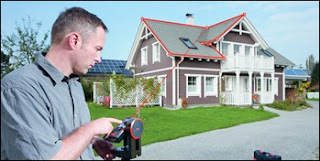 The integrated Smart Base enables measurements between any two points from one location. The combination of the Smart Base and the integrated tilt sensor opens up completely new possibilities making the Leica DISTO S910 the most versatile laser distance meter on the market. Another world’s first! The Leica DISTO S910 can save all the measured points into a DXF file, as a floor plan, wall layout or even as 3D data, which can be downloaded later in the office to a PC via the USB interface. To provide you with complete and reliable documentation, the Leica DISTO S910 also stores all the pictures showing where you measured to. 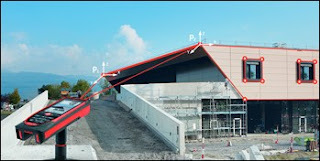 This simplifies the task of creating more accurate drawings, or smoothes the process of quality checks.